Blogging industry is very famous these days & is gaining more momentum from passage if time. On the other hand, hacking is also growing day by day. In past, hacker's main target was social accounts, computers & bank accounts but things have changed significantly. Now, hacker's new focus is on forums, websites & blogs & they are hacking various blogs & websites for variety of reasons. Due to this, almost every webmaster is concerned that he/ she might be the next victim of hackers. This is the main reason of keeping your web presence secure & secure. If you have any blog that is hosted on Blogger, then you might be thinking about how to secure Blogger blog from hackers. In order to protect your blogger's blog from the reach of hackers, continue reading our blog. The possibility of being hijacked is true as plenty of people have faced this worst situation. But it is not possible for everyone to hijack a blogger's blog. It might possible that even in your family & relative knows your password & can guess your password. So in your family, friend & relatives, anyone can hack your blog. Even if you have enables second 2nd stage verification, there is always a possibility of your blog being hijacked. There are many other ways which are used to hijack a Blogger's blog. But following tips will guide you how to secure blogger blog from hackers. The primary and most important step is password. You should be very conscious while setting password. In this article i would like to tell you some vital step of setting password . The password should not contain your contacts, name, pet name, phone number, car number plate, family or celebrity name etc. It should be make by the help of small letter alphabets , capital letter alphabets, signs, symbols and some numbers. Furthermore, try your best 2 set a strong password which should not be less than 8 characters. Set some unmemorable code which can not be judged easily by others. But the code should be memorise hardly otherwise you will forget the password. Do not write the password anywhere as it is a confidential keys. After set up the password, try not to open your Google or any other account from public computers or cafe as its violates the security rules but if emergency occur, open a separate browser and then open the private window. You have to exercise proper care while using themes. There are free low quality themes which are make with the intention to intrude security & hijack the blog using the themes. If you want to use free themes, then use themes available at famous websites. I have seen bloggers that they use cracked/ null themes. Please stay away from them as almost 98 % cracked/ null themes have malicious codes. Instead of being hijacked, it is better to buy a original blogger theme from a trusted source. Best Site to Download Virus Free Templates. Always log in and log out carefully as this worst habit may hack your website. The blogger should always keep remember the signing in and signing out procedure. If you are not habitual of this you might suffer a huge loss of damaging your websites or accounts. People log in to their account and while typing password they are using naked buttons and the people along with them may judge the keys and catch the password. So when you are entering password, be careful about your surroundings. The blogger most oftenly forget to sign out to their accounts and because of this any person who are using your computer may access to your account easily. So make sure that you have sign out before leaving. In order to protect your blog from hacker's attack, you must implement 2nd step verification right now. It is a wonderful & fantastic service from Google to keep secure all Google account. Under this verification method, you have to provide your mobile number to be associated with Google account. This can be done easily from account setting. After adding your mobile number, you can go to security setting & there, you will find 2nd step verification option. On enabling this, Google will send out SMS confirmation to your mobile number which you can use to enable & confirm 2nd step verification. Now whenever you sign in to your blogger account/ Google account, 2nd step verification comes to play its part & on its own, sends a verification code to the registered mobile number via SMS. You need to put this verification code to access your account. If you enter it wrong, or someone else successfully enters your correct user name & password can not go further as he/ she may not have the verification code with him/ her. But for some people, it is quite irritating that he/ she has to enter verification code each & every time he logins to his account. In 2nd step verification, there is also an option to set Don't Ask for Codes Again on This Device. So, you will not have to follow the long process to get into your account. However, if you login from a new computer or clear cache, then you have to provide the SMS verification code to access your account. It is also very crucial that you should use all the methods of recovery. So, in the case your blog is hijacked, you can use any method to access your account & change the password. You should add all your mobile numbers in your account setting for 2nd step verification. There is also an option for adding alternate mobile number if your primary mobile number is off due to any reason. Apart from that add all your email addresses with your Google account so that you may be able to recover your account with email method. The last method to recover your account is to set security question. This is the mostly ignored thing & people do not give due attention to this. Believe me, it is the best option & unmatchable. 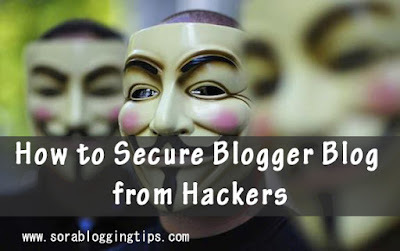 Dear friends, i am hopeful that you have liked article How to Secure Blogger Blog from Hackers. Google has many options which you may use to protect your blog from.being hijacked. It is up to you whether you use these options or not. Remember that your blog's posts are your efforts & you should not give anyone, a single chance to destroy these efforts. Still, you are unclear about any point or want to share something new, drop your comment below as we are listening!